The statistic shows a comparison of Apple iPhone, iPad and iPod sales from the first quarter of 2006 to the company's latest financial quarter. In Apple's forth financial quarter of 2018 approximately 47 million iPhones were sold worldwide. 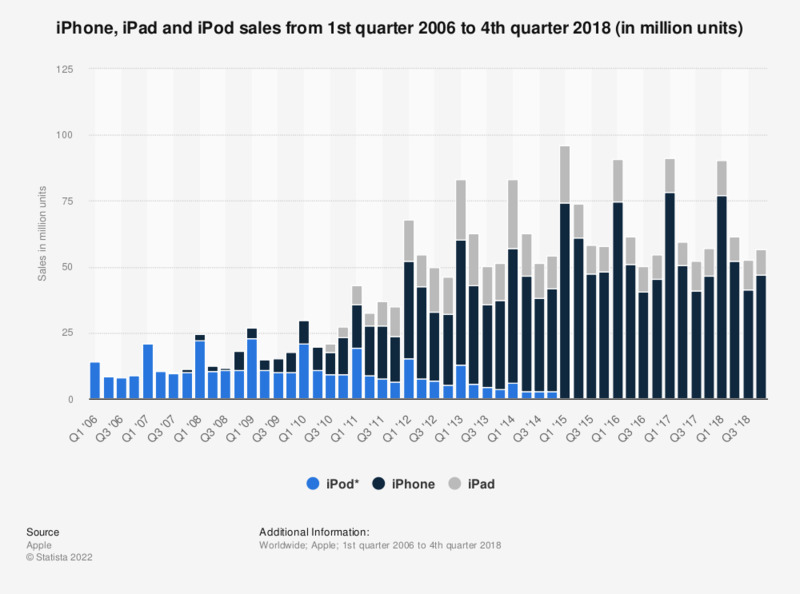 Since the introduction of the iPhone in June 2007, sales of the iPod have dramatically decreased from over 10 million units per quarter on average to less than 3 million units in the fourth quarter of 2014, after which Apple stopped reporting sales figures for the iPod as its own category. In contrast, sales of the iPhone have increased rapidly, with over 211 million units sold worldwide in 2016 and over 77 million units sold in the first quarter of 2018 alone. Apple’s operating system, iOS had a global market share of 12.5 percent in the third quarter of 2017, making it the second most popular operating system in the world behind only the Android OS. Apple released its first iPad in April 2010, with the two most recent models, the iPad Air 2 and the iPad Mini, announced in October 2014. There have been seven versions of the iPad to date. At the beginning of 2012, the iPad was the dominant force in the global tablet market with a market share of 58.1 percent. This share decreased to 25.8 percent in the third quarter of 2017 as Apple faced competition from Google and Samsung. The iPad nevertheless remains a major product for Apple with unit sales of 13 million in the first quarter of 2018, generating revenue of over 5.9 billion U.S. dollars. The quarterly periods for Apple's fiscal year include the following: early October to late December of the previous year (first quarter), early January to late March of the stated year (second quarter), early April to late June of the stated year (third quarter) and early July to late September of the stated year (fourth quarter). * From the first quarter of 2015 onwards Apple stopped reporting the sales figures for the iPod as its own category. Apple stopped reporting unit sales figures from 1st quarter 2019. Women: What device do you prefer to use to view GIFs?